In honor of National Book Lovers Day (albeit, belatedly) I thought I would share some “shelfies”. I really don’t get into the whole concept of selfies, even if the word has been added to the dictionary. But, shelfies? Now that’s a social media trend I can get on board with. For those of you who aren’t familiar with the term, shelfies are pictures taken of one’s book shelves. Many of the book shelves I’ve seen shared are stunningly decorated. Warning: mine are not an example of this level of elegance. I have more books than I have room to store them in. To put a twist on an old biblical phrase,”My shelf runneth over.” The spare bedroom of our house is dubbed “The Library” (don’t tell Sumo, he thinks it’s his room). I don’t even have room for all of my bookcases in there, so I even put one of them in the closet! Most shelves are packed two rows deep and stacked across the tops of other books to maximize capacity. 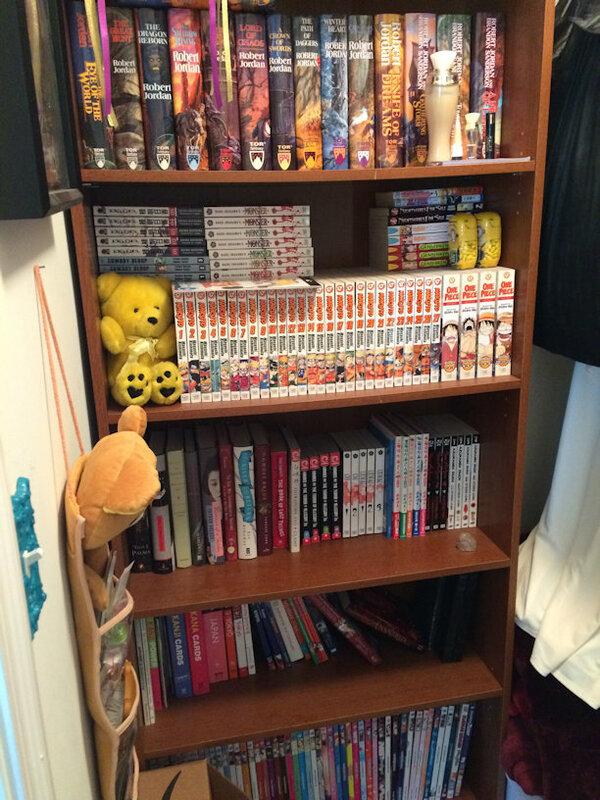 You may notice that the majority of the titles on my shelves now are manga. In recent years, I’ve switched over to buying E-books and audiobooks for my “traditional” book reading. But for manga, there’s just no substitute for the physical book. For books that I really love, I make a point of buying hardback copies–I try especially hard to get first edition copies if I can (like Memoirs of a Geisha down there on the third shelf). The closet bookcase. I would just like to point out what an amazing coincidence it is that the entire Wheel of Time series fit perfectly if the width of this book shelf! Just the tip of the iceberg as I see it! I think that you have very neat and organized bookshelves with many beautiful books. I’ve tried reading mangas years ago and didn’t know how to read it (whether starting to read it from the front to the back), which ended my short manga reading stage. But, I would like to try something new which is by reading mangas and graphic novels. What would you recommend for someone new to reading mangas? Thank you! I love my collection and it’s taken me a long time to, well, collect! 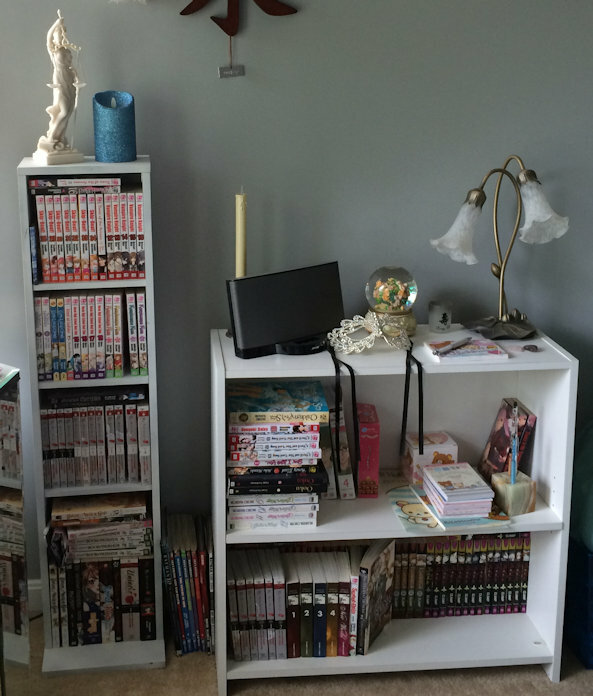 Choosing a manga to recommend is difficult, since there are so many excellent ones available. It’s really based on personal preference, just like any book. My favorite is Skip Beat! because Kyoko is a feisty, determined, humorous and vengeful main character. Every volume has a dose of laughter and romance. Library Wars is a good choice for anyone who loves books. If you like adventure and fantasy you can’t go wrong with Full Metal Alchemist. Thank you for replying so quickly! 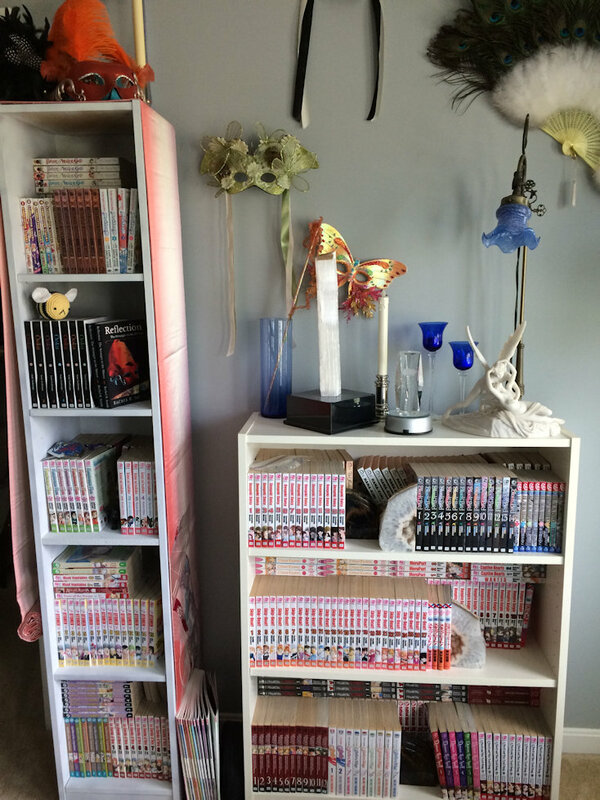 I love your collection and hope to someday have my own collection of mangas. The genre of novels I usually like to read is fantasy, historical fiction, and so compensatory. Library Wars sounds interesting and sounds like something I would enjoy. Thank you for the recommendations. I really appreciate it! There are a few historical fiction manga I can recommend. The most well-known is Emma by Kaoru Mori. It’s set in Victorian England and is about a romance between a maid and an English gentleman. It came out awhile ago though, so it might be hard to get copies now. I think the publisher went out of business. The same author also did another historical fiction called Bride’s Story. I haven’t read it, but it is supposed to be very good as well. I’m currently reading an AU historical fiction called Ooku: The Inner Chambers. It’s about the Japanese shogunate during the Edo period. The premise is that a disease affecting only males has reduced the population of men in Japan to the extent that they are sheltered from society. The government, including the shogun, is entirely run by women–so it’s a historical role reversal. The art is gorgeous, but the story is very intricate and a bit hard to follow at times because it goes into a lot of depth in Japanese politics of the time period. I hope you find something you like from my recommendations! Always happy to spread the love of manga. ^_^ I’d love to hear when you find a series you enjoy!